After all the endless sights of Eurobike, it was on the train back to our apartment that we spotted what is one of the most interesting things we’ve seen. We’ve garnered what information we could in the few stops we had on the train before we had to get off (we were tempted to stay on and chat some more, but it’s been a long day and we’ve a lot to do before we get to the airport at 4am. Yes, 4am). Forgive the pictures and the gaps in our knowledge, we’ll do our best to hook up with Tim, the bike’s creator, and get a better sit down with him some time in the future. Preferably not on a train next time. Tim is an engineering surveyor – which is someone who is very good at accurately measuring static stuff on the ground, so the complex mathematics and physics of kinematics and suspension design are something that he’s learnt himself. He told us (on the train) that he taught himself everything he knows, starting about six years ago when he first came up with the basic concept, by going to free lectures at a local university, watching YouTube videos, and doing lots of reading. You’ve got to admire anyone who can pursue something like that to such a degree. And indeed his current website contains veritable essays on how suspension works, complete with hand drawn diagrams. He might be a little upset with us for pointing this out, because he did say he’s still working on his website and it will be ready in a few days, but even your kids could probably tell you that there’s no deleting what’s on the internet (and if they can’t tell you that, you need to have words). So yes, sorry Tim, but we’ve been nosing around your unfinished website. For all you readers out there, we hope that the new website doesn’t do away with all the kitchen table/garden shed type information, as it’s really nice to see how Tim has gone through the thought process and research to get to where he is now. And where is he at? Well, he’s got two things: a new suspension platform, plus a bike. 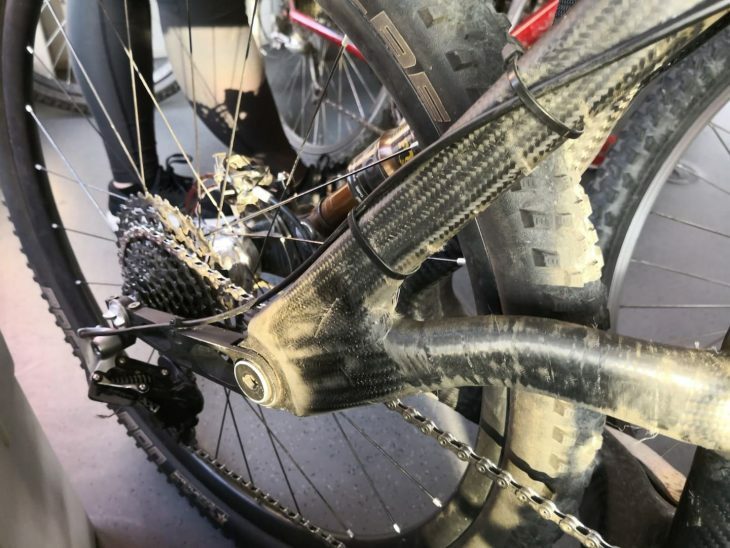 The bike is carbon, and bits of it were made in a factory in India, and other bits were made in Tim’s shed, which might be in Australia, or could be in the Maldives – he gets around a bit. As yet the bike doesn’t have a name, and Tim seemed quite surprised that we thought he should think about designing a head badge. Nice that he’s not a ‘let’s think of a really good band name before we write any songs’ kind of a guy. The bike he has on the train is the 5th iteration, and he thinks it’s just about there, although he’s obviously been passing it round a bunch of mates to get feedback, as he says that while he find it really comfortable, a few people have found it’s too bulky in certain spots, meaning heels can rub on the right side and there’s a spot on the seat tube that can rub a rider’s thigh. He’s planning another iteration that will shave a few millimetres off here and there to address these rub points, plus he’s going to try and create a bit more clearance for tyres – all while maintaining as boxy and stiff a shape as possible. 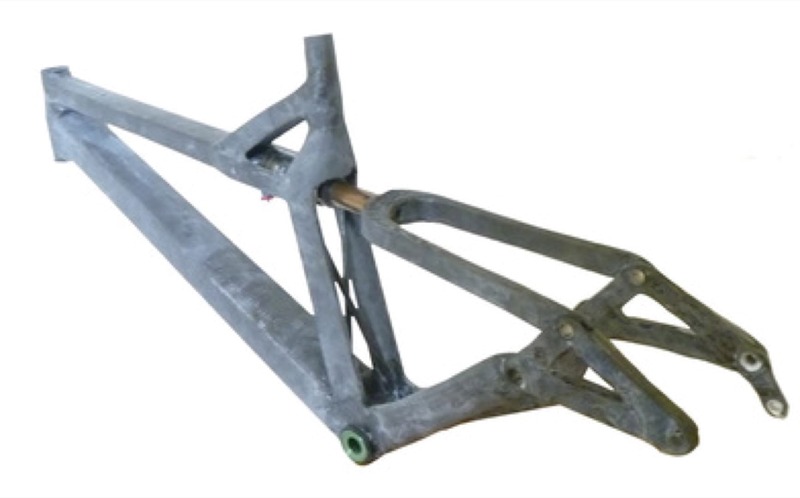 He’s created a conventional chainstay before, but thinks that this elevated one is the best solution. Whatever he calls the bike, it’ll be different to the suspension system, which he’s calling VAST Tech, because he hopes that he’ll be able to licence out the system – or ‘sell out’ as he puts it with his very Australian bluntness. It’s a refreshing end to the endless marketing speak of the ‘professional’ product stands on show at Eurobike. We don’t know what VAST stands for, and in a masterstroke of marketing failure Tim says it’s ‘not that there’s anything special about the name, but I had to call it something’. The way he pronounces it, it sounds rather like ‘Vastech’, or ‘Vaztech’, which might well be a supplier of keyhole surgery items for vasectomies. Instead of having the pivot point somewhere in the vicinity of the bottom bracket like most bikes, he has moved the pivot point all the way back to somewhere approximately two thirds of the way back down the seat stays. Or at least where the seat stays would be, if they weren’t, well, way back there. You’re probably going to need another picture. Trust us, we’re even more sad than you are that we didn’t manage to spot Tim and his bike until we were all squeezed onto a train out of Friedrichshafen. We’d love to have been able to get more pictures, and even better to have been able to ride it. Tim says that the initial point of contact on a square edge bump leads to more rearward action, which is good. 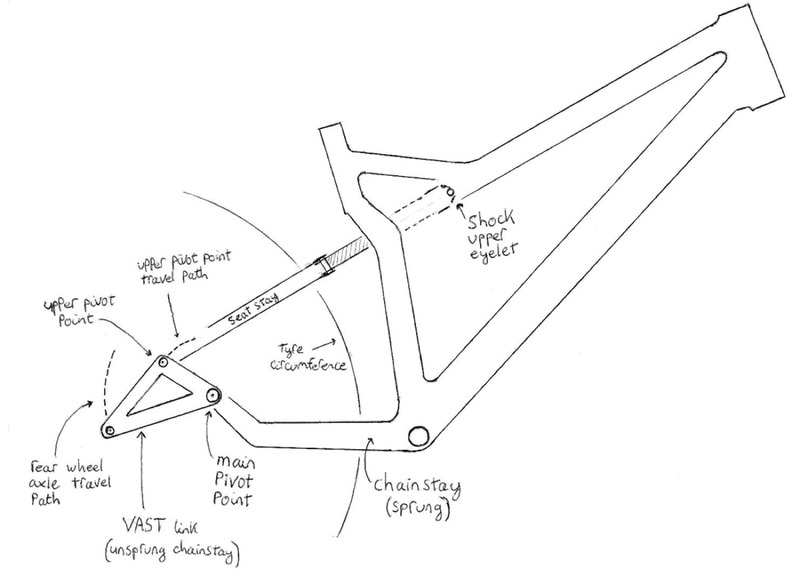 But too much rearward movement creates excessive chain growth, and further into the travel, that chain interaction with the pedals can cause pedal kickback. 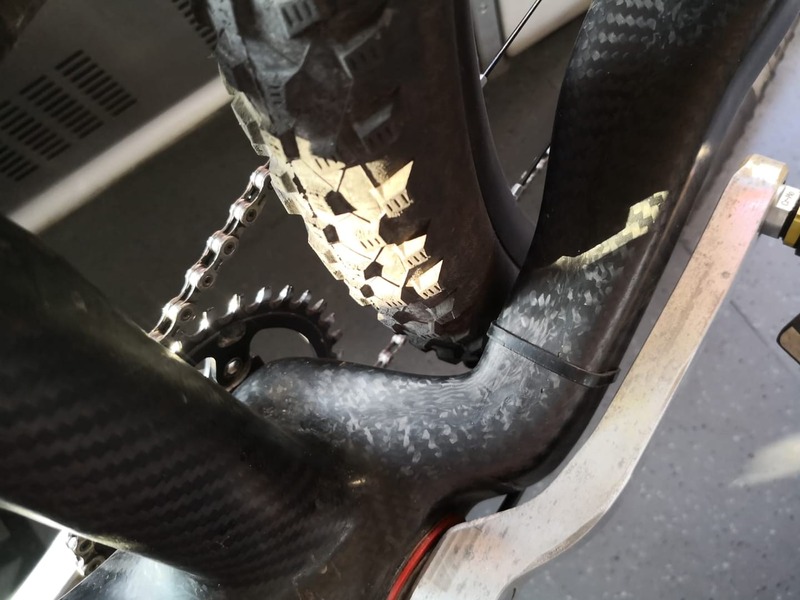 Despite the rearward axle path of his design though, Tim says he only hits 12.1mm of chain growth at full compression. He reckons that an equivalent bike will hit 17.1mm of chain growth – and his that his kick back is about 22% less as a result. In summary, he thinks the square edge sensitivity is better, the pedalling is better, there’s less kickback, and it’s loads lighter, which is important for mass that’s hanging off the rear axle. He reckons he has 235g of unsprung weight compared to a typical 800g for other bikes, which gives him a responsive and supple ride on small bumps. So why don’t other brands build a suspension bike like this then? 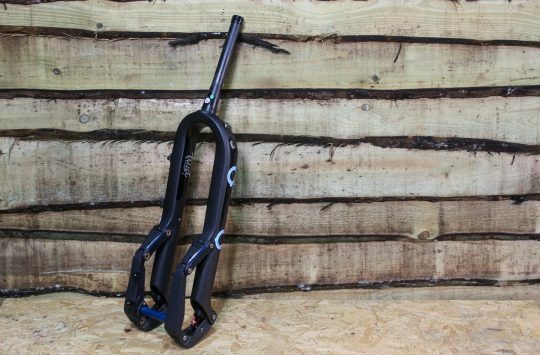 Aesthetics and packaging are two good reasons – with that pivot sitting so far back, there’s some tricky issues around clearance with the drivetrain, and fitting the rear shock in somewhere suitable. On top of that, creating enough strength and stiffness through that main pivot has proven to be a challenge for Tim. 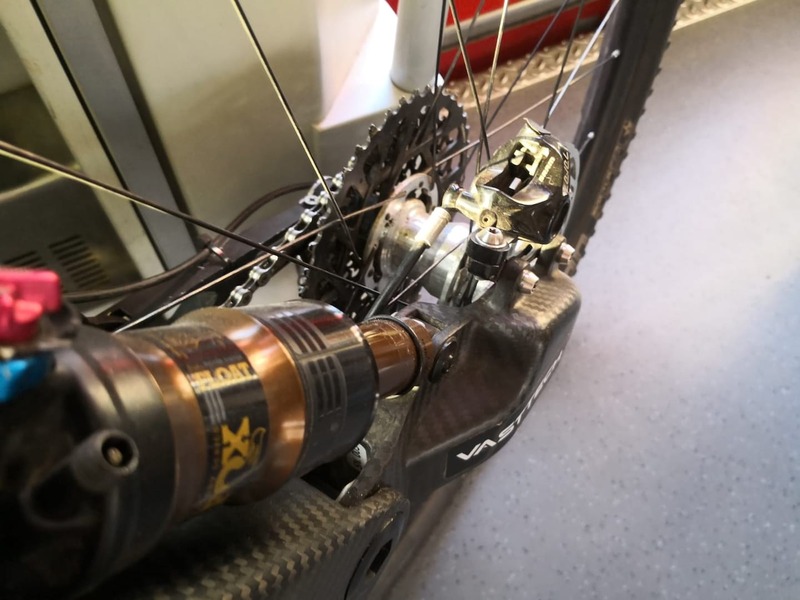 On his latest prototype however, he has an enormous custom-built 40mm diameter axle on the rear wheel and his own huge hub to give the stiffness needed to deliver the suspension at that position on the bike – but it still gives him the lighter unsprung mass that he was looking for. He says he gone to great lengths to ensure that the rear wheel is very good, and that he’s had some friends riding it and taking it off some big gap jumps. Which is reassuring. He’s going to work on the clearance for the next iteration. Finishing on some numbers, Tim told us this particular bike has 112mm rear travel and a 120mm fork, although he’s modelled up to 140mm of rear travel and still gets a good shock leverage ratio and curves. He hasn’t modelled any further than this because he’s not convinced that the big plus of this suspension design – its pedalling efficiency – is of too much interest to the downhill crowd, so he’s concentrating on the short to medium travel market where pedal efficiency is of more concern. What do you think? Would you be interested in buying a bike like this? If you’re not at least a bit curious to find out more then, frankly, we’re disappointed in you. Watch this space and we’ll do our best to get you a ton more detail. 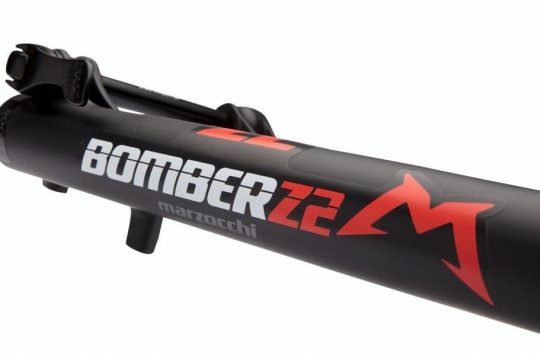 Reminds me of the Merida LRS suspension design, although that was more to reduce the high pressures in the rear shock. Still an interesting idea though. Never met him but Tim seems like an awesome guy. Definitely and interesting idea. 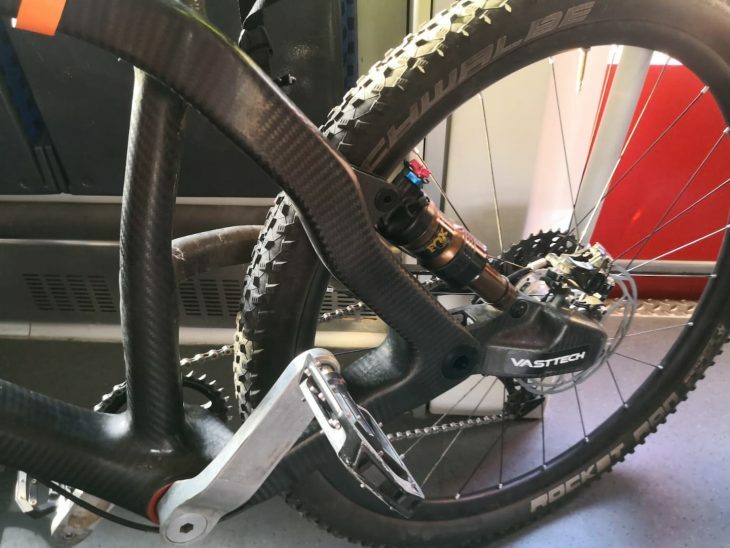 Most interesting thing out of Eurobike so far, well spotted and a nice writeup. Looks like there’s a fair bit of custom kit needed to equip the frame, unfortunately. Didn’t Boulder Bikes do something like this back in the 1990’s ? 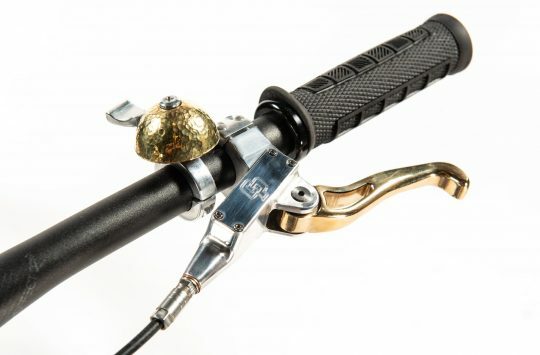 There was something similar in the 90’s that you bolted onto the back of a hardtail – pivots and elastomers, made it more of a softail though than 4+” of travel … but this looks interesting. Surely it should have a one sided fork as well? Didn’t Cannondale do something like this way back when? @pmurden: I think Cannondale’s version was similar but actually a swingarm on a swingarm, if you get what I mean? !